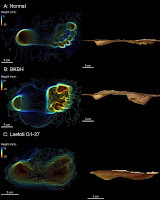 Experiments by a UA anthropologist and his colleagues show that fossil footprints made 3.6 million years ago are the earliest direct evidence of early hominins using the kind of efficient, upright posture and gait now seen in modern humans. More than three million years ago, the ancestors of modern humans were still spending a considerable amount of their lives in trees, but something new was happening. The results of their research appear in PLoS ONE, a journal from the Public Library of Science. The most likely individuals to have produced these footprints, which show clear evidence of bipedalism, or walking on two legs, would have been members of the only bipedal species alive in the area at that time, Australopithecus afarensis. That species includes "Lucy," whose skeletal remains are the most complete of any individual A. afarensis found to date. A number of features in the hips, legs and back of this group indicate that they would have walked on two legs while on the ground. But the curved fingers and toes as well as an upward-oriented shoulder blade provide solid evidence that Lucy and other members of her species also would have spent significant time climbing in trees. Since the Laetoli tracks were discovered, scientists have debated whether they indicate a modern human-like mode of striding bipedalism, or a less-efficient type of crouched bipedalism more characteristic of chimpanzees whose knees and hips are bent when walking on two legs. To resolve this, Raichlen and his colleagues devised the first biomechanical experiment explicitly designed to address this question. The team built a sand trackway in Raichlen's motion capture lab at the UA and filmed human subjects walking across the sand. The subjects walked both with normal, erect human gaits and then with crouched, chimpanzee-like gaits. 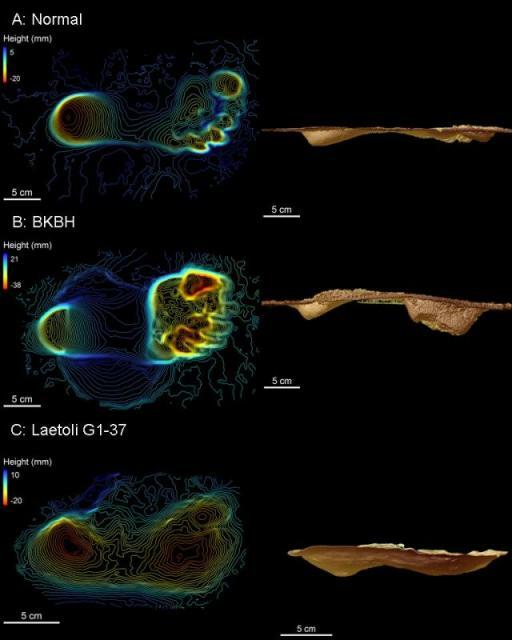 Three-dimensional models of the footprints were collected by biological anthropologist Adam Gordon using equipment brought from his Primate Evolutionary Morphology Laboratory at the University at Albany. "What is fascinating about this study is that it suggests that, at a time when our ancestors had an anatomy well-suited to spending a significant amount of time in the trees, they had already developed a highly efficient, modern human-like mode of bipedalism," said Gordon.